Gardman Cornflower Kinetic Wind Spinners, Verdigris, 2 Pk. 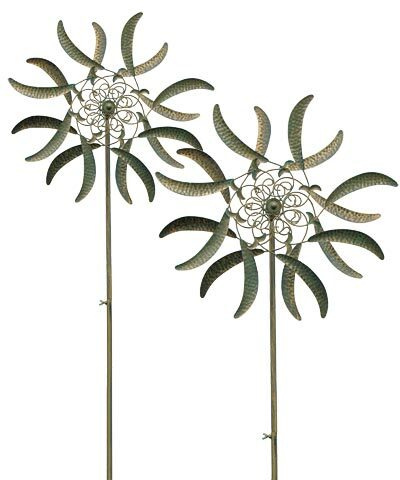 Celebrate flowers and sculpture in your garden with these Gardman Cornflower Kinetic Wind Spinners. This set of 2 spinners brings a vivid look to your yard, thanks to their dual toppers, dramatic blades, and verdigris hues. Delicate scrolls form the center of each 20" diameter topper, with thin metal rods extending outward and expanding to form a striking petal shape. A slight curve in each petal, along with hidden bearings, helps capture the wind and spins the toppers for a fantastic effect. The included, 53" tall stakes with step-in bases bring height to each spinner, and help keep them stable in your garden soil. Gold hints throughout the metal body gleam in sunlight, and perfectly enhance the verdigris background hue. The units assemble with ease, and the alternating curves of the petal shapes offer an artistic hint. Add fantastic, lasting blooms to your landscaping using these Cornflower Kinetic Wind Spinners. Some assembly required. Note: This case pack includes 2 of the Gardman Cornflower Kinetic Wind Spinners, Verdigris, 63"H.
Availability: 2 in Stock. Ships from OH within 24 business hours , 2 available at this price!